Property owners all across Canada are familiar with snow, ice and all of the problems that come along with them. While changing seasons might signal irritation for property owners, it means a whole lot of fun for our maintenance experts. 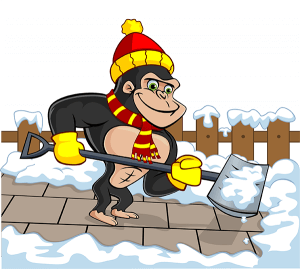 Save yourself the trouble of heavy lifting and frozen toes by calling in a Gorilla for your Milton snow clearing and salting services. Gorilla Property Services offers both routine and occasional services for homes and commercial properties. Snow removal on its own sounds simple enough: Step one: grab a shovel, step two: remove snow. On paper, this is easy enough but actually carrying out the chore is more complicated than meets the eye. Depending on the size of your property, even the most basic practices of snow removal can take a lot of time and muscle. Keeping on top of snow around an unattached house might involve clearing away a driveway or sidewalk, but strata or multiunit properties are much more involved. In the case of rental properties, owners or managers are responsible for the safety of the tenants who live there. Without proper snow removal tactics, accidents become more and more common. Should any of these accidents, no matter how minor result in injury, owners can be held liable. Instead of taking the risk with your property, choose a routine snow removal service that works. Difficult to reach storefronts are a major deterrent for potential clients and customers. Some property maintenance firms might focus solely on residential spaces, but our Milton snow clearing and salting can be applied to commercial and strata properties as well. By offering more than a one-size-fits-all treatment plan, our Gorillas are able to cater to the needs of individual properties. Now, as we all know, snow does not wait for a sunny afternoon to begin to fall. The most common timeframes for heavy snowfall are during the late night or early morning hours. 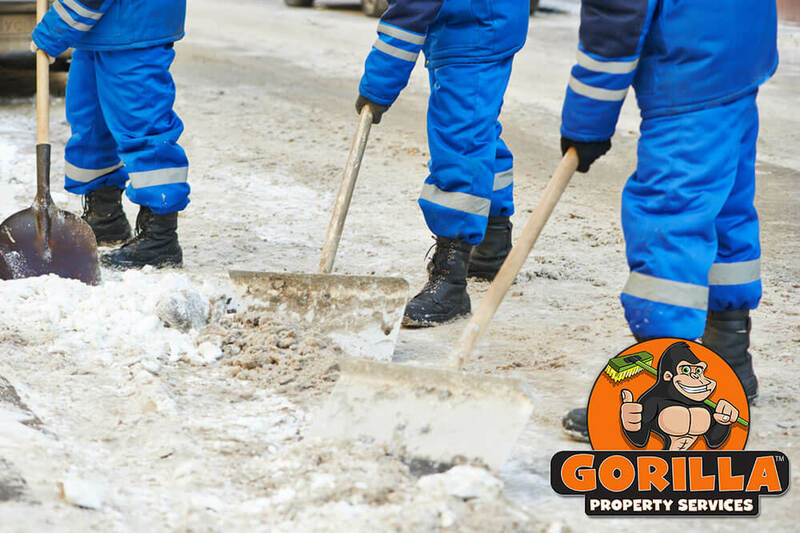 In order to keep ahead of snowfall, our Gorillas work at any time of day or night to accommodate our clients. If your residential property requires overnight care, you don’t have to worry about being woken up! While using snowblowers during the day might provide quick results, by-hand methods are more suitable for those late-night services. You might not hear our Gorillas, but they are certainly easy to spot. With flashy uniforms and colourful Gorilla-mobiles, our clients can always spot a Gorilla hard at work. While snow might make properties impassable, ice makes it downright dangerous. While ice contributes to minor slips, it can also mean serious bodily harm. Because of this, snow and ice are a part of general safety concerns. By-laws state that any publicly accessible area needs to be as free of ice and snow. Try as you might, trying to tackle de-icing can be difficult without the right technique and experience. Instead of throwing down a fistful of salt or sand, our Milton snow clearing and salting tackles the problem areas around your property and constructs a plan to keep your outdoor space welcoming.